Whisky has always been a social drink, so it is no surprise an active community of whisky enthusiasts has emerged on Instagram. For anyone considering building their own account, Felipe Schrieberg shares tips and tricks from Instagram’s whisky influencers. A dynamic community has been thriving on Instagram, united by all things #whisky. It’s a place to trade reviews, show off bottles and create connections with others while celebrating a common passion: the water of life. Yet the whisky world on IG, like the platform itself, has rapidly evolved. There are more accounts posting pictures than ever before, more hashtags to track, and IG’s Stories and Highlights add new dimensions to creating photo content. It’s not enough to post the odd picture anymore; successful accounts now require serious commitment. However, if you make the effort to create unique whisky content and engage with the wider community, you’ll eventually land followers, ‘likes’ and other whisky opportunities. Don’t go into this for the money though. All the Instagrammers interviewed stressed that, unlike professional IG influencers working in other industries, this is still a hobby for them. None receive anything close to an income for their social media work. However, some Instagrammers have managed to leverage further professional opportunities (such as photographers being hired for a job), free whisky and the opportunity meet people working in the industry. 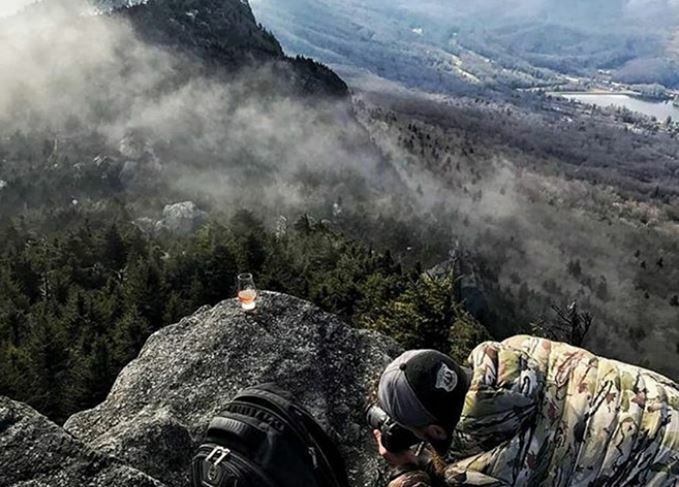 So whether you just want to reach the widest audience possible or connect with the whisky industry itself, here’s advice from the community’s top whisky Instagrammers. It’s a cliché, but it’s true. Find a unique approach with your account and don’t be afraid to get creative. With regular Instagram posts, it’s best to stick to your ‘thing’ (Woodruff’s outdoors whisky posts are a good example). If you have figured out that your ‘thing’ is to take pictures of whisky bottles featuring your adorable corgi, then don’t stray too far from that theme. It’s one thing to be unique and consistent with your theme, but another to create content that varies in style. To use a painting analogy, your Instagram account should be the equivalent of regularly painting bowls of fruit (your consistent theme or unique angle) in different ways. Some Instagrammers have extensive photography experience and equipment. Some just need their phone. Erik McRitchie, a professional photographer and one of the four friends behind @frombarreltobottle (11.7k followers), believes it’s not about the gear you use, but how you use it. Put the ‘social’ in ‘social media’. Comment and engage with other accounts you like, and answer the comments you get on your page. Post regularly. Tag brands and relevant brand ambassadors if you write about a particular bottle. Considered use of hashtags also matters. Mix popular hashtags (such as #whisky), less popular ones, and don’t repeat them all the time. Some Instagrammers also expressed frustration with hashtags that have no connection with the photo as this clogs up their feed; avoid this trap as well. Collaborations can also provide interesting opportunities and lead to unique content. It can be as simple as running guest posts, re-posting each other’s pictures (with permission), or doing shoots together. Honesty is also important when free whisky or money is involved. Did you get a bottle from a brand to review? Are you being paid to post a picture of a product? Are you taking pictures during an all-expenses-paid press trip? Denote this by using hashtags such as #advertisement or #sponsorship, making the nature of the post clear. It’s become enough of an issue for the Federal Trade Commission in the US to issue warnings about truth-in-advertising standards on Instagram, while some of the world’s top influencers have now agreed to be more transparent about their commercial posts.